PerfectTablePlan newsletter 40 - PerfectTablePlan v5 now for sale! PerfectTablePlan v5 is now for sale! Can you believe it is only a few months shy of 4 years since we first released PerfectTablePlan v4? 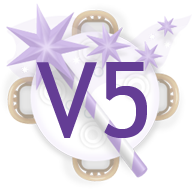 We've been working hard on v5 for the last 18 months and its finally ready! The comments from customers who have been beta testing v5 for the last few weeks have been very positive and it has already been used for the Queen's Diamond Jubilee! See below for more details. Go the release page to find out more and download a free trial. Who is entitled to an upgrade discount? Anyone who has purchased an earlier version of PerfectTablePlan, whether version 1, 2, 3 or 4. The upgrade licence will be issued in the same name as the licence you are upgrading from. If you are a first time purchaser of PerfectTablePlan, you aren't entitled to upgrade - you'll have to buy a new licence. How do I prove I am entitled to an upgrade? Can v5 read plans from earlier versions of PerfectTablePlan? Yes. It will even read plans from PerfectTablePlan v1! Plans created on Windows and Mac are also interchangeable. Will v5 install over the top of earlier versions of PerfectTablePlan? No. It won't affect earlier versions of PerfectTablePlan or any plans you have created. For example, you can have PerfectTablePlan v5 and v4 both installed, licensed and running at the same time on the same PC/Mac. Do I have to uninstall earlier versions of PerfectTablePlan before I install v5? No. You can if you want to. Or you can leave them installed. Given that they use minimal disk space (each version uses about the same disk space as 20 digital photos), we tend to leave them installed. Is there anything I need to do before installing PerfectTablePlan v5? We recommend you always back-up any important plans (e.g. to CD, memory stick or another hard drive) before installing or uninstalling PerfectTablePlan. On Windows: 8, 7, Vista, XP (both 32 and 64 bit variants are supported). On Mac OS X: 10.8, 10.7, 10.6, 10.5 (Intel processor only). Will v5 run on an iPad? No. But you can now export your plan to the web and access it from any web enabled device, including an iPad. Another approach is to use the free LogMeIn iPad app to access PerfectTablePlan on your PC or Mac from your iPad (NB/ the use of third party software is at your own risk). What happened to v5.0.0 and v5.0.1? Absolutely! You just won't be able to save, print or export plans with more than 30 guests until you buy an upgrade to v5. What if I decide v5 isn't for me? Just uninstall it. We might have a little cry, but we'll be fine. Really. Yes, our standard 14-day money-back guarantee also applies to upgrades. How long will it take me to download, install and start the free trial? 1 minute and 31 seconds. We timed ourselves. It might take you a little longer if you have a slow Internet connection or a teenager upstairs downloading movies. If you purchased PerfectTablePlan in the last 3 months (on or after 18-Mar-2012) you are entitled to a free upgrade. You should already have received your free upgrade licence by email. If you haven't, please check your spam folder and try our online key retrieval system before contacting us. Which edition can I upgrade to? If you purchased v1, v2, v3 or v4.0 you will be upgraded to v5 Home edition. How much does it cost to upgrade to v5? Buying an upgrade is 60% cheaper than buying a new licence. Can I buy a CD with v5 on? Yes. Hybrid CDs containing both the Windows and Mac versions of PerfectTablePlan v5 are available as an optional extra for £7/$13/€9, including post and packaging. They come in smart DVD style packaging and we mail anywhere in the world. We haven't increased this price despite a recent 68% increase in the price of airmail from the UK to the rest of the world. Just check the 'CD in the mail' box on the upgrade page. How do I upgrade multiple licences or an organizational licence? How stable is the new version? It has been heavily tested by us, by professional third party testers and by 100 customers who signed up for the beta test. So far it has proved to be very stable. If I upgrade now, what additional features will I get in future releases? You will get every update we release for your edition of PerfectTablePlan until we release v6. So there is no reason to delay your purchase. Can I also upgrade to a higher edition? Yes. After you have purchased a version upgrade (e.g. v4 Home edition to v5 Home edition) you can also purchase an edition upgrade (e.g. v5 Home edition to v5 Advanced edition). We have just dropped the prices of all edition upgrades, so there has never been a better time to do this. So how do I buy an upgrade to v5? Click the button below to make a quick and secure online payment. "Wow! Watching the changes from version 2 to version 5 has been like watching a child grow from a precocious toddler to a brilliant adult! I have been a non-profit executive, fundraiser and event planner for 40 years and found PerfectTablePlan version 2 in March of 2006 just as I was planning an international conference for my organization and an awards program honoring Harry Belafonte for his advocacy and human rights work. I had done quite a bit of research to find the best software to plan and organize events and PerfectTablePlan emerged as the only software program that enabled me to comprehensively and affordably organize the layout, seating, ticketing, programming of the entire event-conference, registration, breakout sessions, award luncheon, programs and everything. "Having run Version 5 for the past few weeks I find the flexibility and power of it amazing and I'm now really starting to appreciate the sea-change in capability since those early days of using this excellent package. From what I've seen so far I suspect it will be a long time, if ever, before I have to concern myself about the lack of any particular function; this really does seem to have covered all the bases. As used in the Queen's Diamond Jubilee! A beta test version of PerfectTablePlan v5 was used at one of the official government events at the recent Queen's Diamond Jubilee in London. This was a very important event, attended by ambassadors and other VIPS, and they wanted to ensure there were no gaps in the seating caused by last minute cancellations. PerfectTablePlan v5 was used to assign seats and the new 'VDU chart' displayed the seat assignments as continuously scrolling text on a 50 inch plasma screen. This allowed seats to be reassigned and the display updated in 'real time' to ensure there were no empty seats. We are told it "Worked a treat".